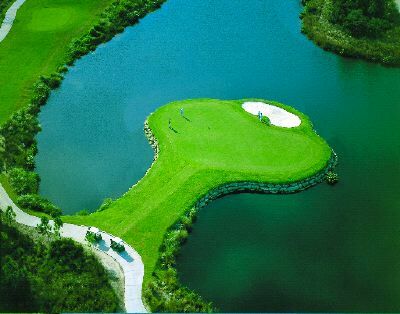 Grand Haven golf community in Palm Coast, Florida. 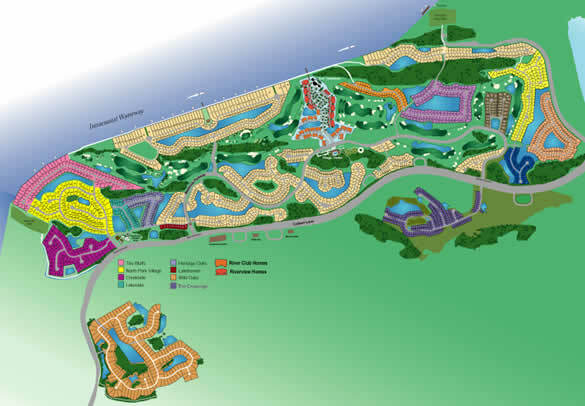 Grand Haven is the premier residential golf community on Florida's east coast featuring the 18-hole Jack Nicklaus Signature golf course, a world-class country club, a gated community with large homesites and award-winning builders. Located on more than 1,350 acres along the Intracoastal Waterway in Palm Coast, Grand Haven is just south of St. Augustine in Flagler county where shopping, dining and entertainment venues are just around the corner. Enjoy year-round waterfront living in a private club community at Grand Haven. See site map. This master-planned community is comprised of 1,901 residential homes in intimate villages linked by winding trails and tree-lined streets. Bike paths, parks and an adjacent 4,000-acre nature preserve highlight the community's natural beauty, making outdoor activities a way of life. At Grand Haven, nearly half of the land is devoted to public parks, archaeological sites, freshwater lakes, recreational areas and nature preserves. Grand Haven's Creekside Athletic Club offers an indoor lounge and game room, fitness center, swimming pool, children's pool and cabana, regulation-sized croquet court, junior soccer field, volleyball and basketball courts, outdoor grilling area and, coming soon, a community fishing pier. Residents enjoy a picturesque riverfront that has been preserved in its natural state and features a 2-mile long, 10-foot wide esplanade ideal for biking, jogging or leisurely strolling along the river. Grand Haven features sidewalks extending from the neighborhood villages to main community thoroughfares, common areas and the many amenities. The Spanish-inspired Village Center features a European-style cafe, junior Olympic swimming pool, world-class spa, fitness center, croquet, horseshoes, children's play area, shuffleboard, Har-Tru lighted tennis courts and multi-purpose room. Choose from a wide array of unsurpassed home offerings, ranging from maintenance-free, condominiums, townhomes, and single family homes including compact patio homes, golf villas, and custom homesites where you select house plans offered by preferred builders or custom build your own design. Community builders are Arthur Rutenberg Homes, Brattlof Classic Homes, Country Club Homes of Florida, Wayne Homes by Centex Homes, David Weekley Homes, Discovery Homes, Howell Homes, ICI Homes, Red Carpet Construction, Richard R. Dostie by Toll Brothers Company, SeaGate Homes, and Whitehall Quality Homes. Waterfront estate living with Intracoastal Waterway homesites from the low $700's. Maintenance-free patio homes in a wooded preserve setting. Homes from 1400 to over 2100 square feet are priced from the low $300's including homesite. Located in the heart of the community and adjacent to the Golf Clubhouse and Village Center, these maintenance-free Club Homes offer views of the Jack Nicklaus signature golf course, pristine lakes or wooded nature preserves. Upscale one and two-story townhomes with two car garages from 1,800 to 2,200 square feet include the price of homesites and begin in the mid $300's. Experience Mediterranean charm in this exclusive enclave of 53 homesites that feature pristine lakefront and nature preserve vistas. Heritage Oaks features maintenance-free homes that are priced from the mid $400's including homesite. Overlooking three lakes, Hidden Lake offers house and lot packages by five of Grand Haven's Preferred Builders. Priced from the mid $400's. Bordering two sparkling lakes and a conservation area Lakeside is the perfect place to relax and play. Here you'll enjoy the natural beauty and privacy that surrounds your home combined with the convenience of being located around the corner from the brand new Creekside Athletic Center. Luxury villa homes including the homesite are priced from the high 400's. Carefully situated among shimmering lakes and pristine wooded conservation areas, this peaceful neighborhood of rolling coastal terrain offers custom homes priced from the low $300's. House and lot packages by Grand Haven's family of Preferred Builders. Priced from the high $500's. Nestled between two sparkling lakes and a woodland preserve, this intimate village features courtyard homes and maintenance-free lawn care. Pine Harbor is an unique combination of country club lifestyle and affordable Florida living. Patio homes including the price of homesites begin in the high $300's. Mere steps from the Golf Clubhouse, Intracoastal esplanade and Village Center are the new Riverview Homes at the River Club. These maintenance-free condominiums feature spectacular views of the Nicklaus golf course and Intracoastal Waterway. Upscale two- and three-bedroom condominiums (plus penthouse plans) with two-car garages from 1,750 to over 3,000 square feet, starting in the high $400's. Featuring spectacular views of the eighth-hole island green and ninth fairway, as well as access to a two-mile nature walk. Riverwalk residents will enjoy relaxed, maintenance-free living in a quiet, natural setting reminiscent of the French countryside. Golf villa homes include the price of homesite and begin in the mid $500's. Nestled along a hardwood preserve in the Southeast corner of Grand Haven is South Park Village. A private enclave of 48 estate-sized homesites. This neighborhood features picturesque lake and conservation views. South Park Village features house and lot packages by Grand Haven's family of Preferred Builders. Priced from the high $400's. Combining natural beauty with the convenience of nearby amenities, Wild Oak Estates is Grand Haven's last opportunity for large homesites. Priced from the high $100's with custom homes starting from the high $300's.